Why you should choose an exceeding childcare centre. Quality Childcare comes in many shapes and it is often difficult to tell if a childcare centre is the right choice. You want to know that you are leaving your child with the someone that not only meets the national standard but exceeds the national child care standards. In this article we will discuss the importance of quality child care and how child care centres are rated, so you can choose the best child care centre for you and your child. Quality Childcare comes in many shapes and forms but always looks like fun in a loving environment. Research shows quality education and care early in life leads to better health, education and employment outcomes later in life. The early years are critical for establishing self-esteem, resilience, healthy growth and capacity to learn. Quality education and care shapes every childs future and lays the foundation for development and learning. Kids College are very proud of our part in our families lives, creating the very best quality care every single day. “Kids College has a profound passion and dedication to our part in raising our children. We believe that each child has the right to a happy, safe, secure and educationally focused childhood. We provide loving care to our children as well as a commitment to providing the best quality educational experiences. Our philosophy is reflective of our shared values and is embedded into every aspect of our service. Childcare accreditation and quality is governed by two bodies, Education and Care Regulatory Unit (ECRU) and the Australian Childrens Education & Care Quality Authority (ACECQA). The National Quality Framework introduced a new quality standard in 2012 to improve education and care across long day care, family day care, preschool/kindergarten, and outside school hours care services across Australia. 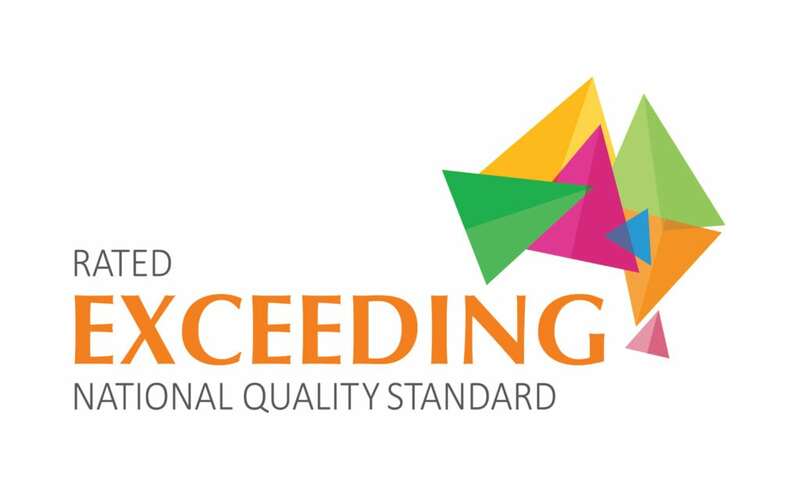 The National Quality Framework includes National law and regulations, National quality standards, Assessment and ratings process and the national learning frameworks. The accreditation system offers five levels of quality in child-care centres. Start off with significant improvement required, working towards, meeting and culminate in the highest level, exceeding the national standards. These levels are earned by childcare centres who complete the ratings and assessments process with ECRU. 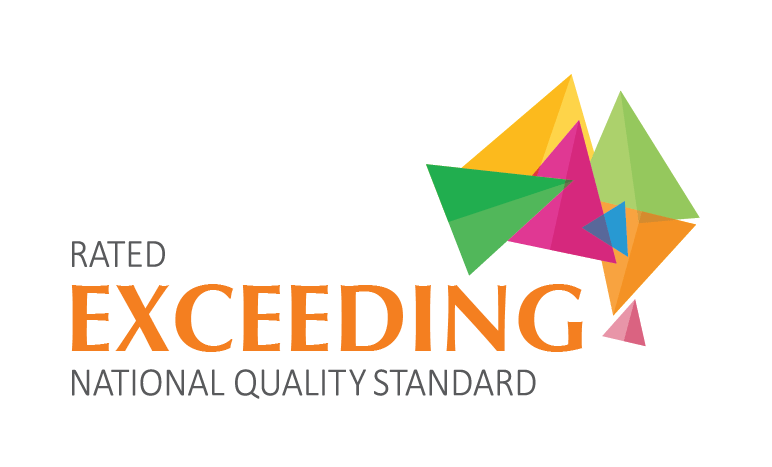 Australian Childrens Education & Care Quality Authority (ACECQA) works with all governments to provide guidance, resources and services to support the sector to improve outcomes for children and offers an additional excellence criteria. 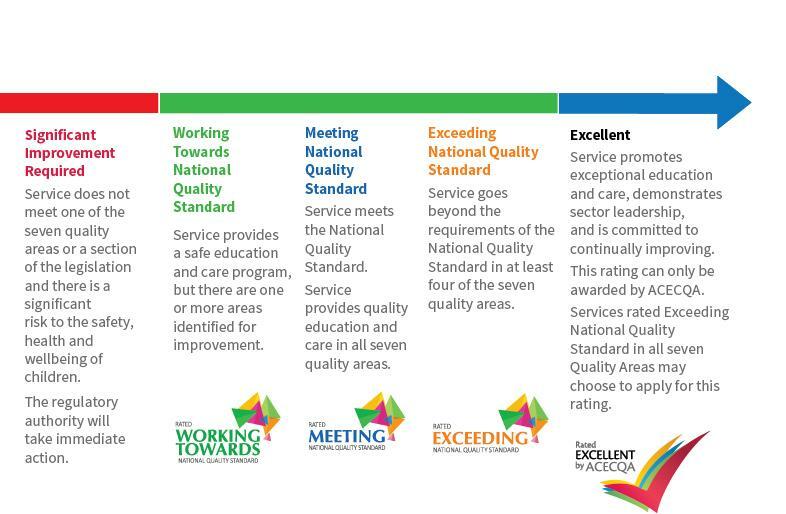 For more information on the National Quality Framework please visit here. Kids College has earned the highest rating, Exceeding the National Quality Standards awarded by the Education and Care Regulatory Unit. This means we are not just meeting the standards, as our local neighbouring centres are rated, but we have exceeded the national standards by showing great dedication, care and love elevating our centre to the highest rating. Kids College have been rated exceeding in each of the quality areas and overall. We lost one point on our astro turf outside but are happy with our decision to add this valuable resource to our play space and keep an engaging, clean and great looking backyard playground for our children. Our system of continual improvement and our ethos of always going the extra mile to create the very best quality child-care assures our families of our excellence. 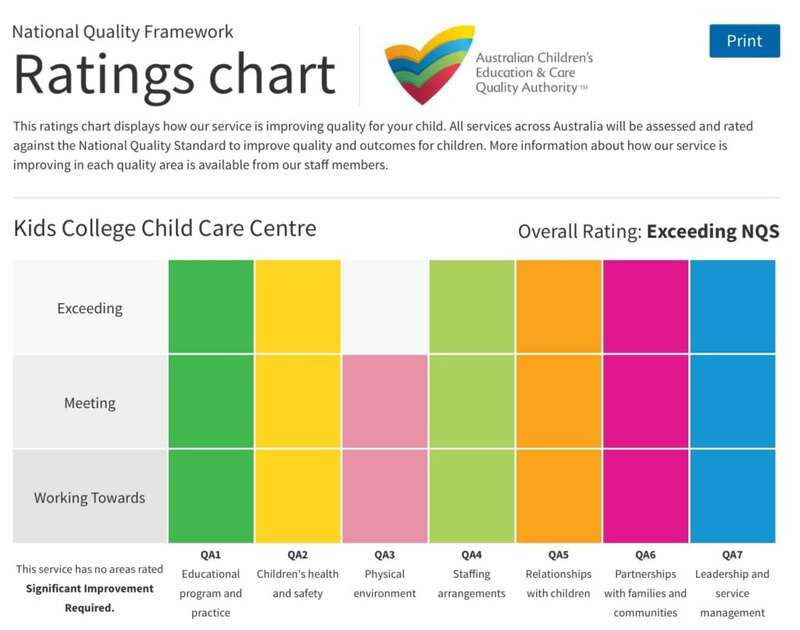 We are currently aiming at the excellence rating awarded not by Education Care and Regulatory Unit but by a seperate system offered by Australian Childrens Education & Care Quality Authority (ACECQA) in the hopes of being the only centre in Western Australia with this rating. What to look for in a childcare? Simply put, look or a childcare that shows you they genuinely love their children and are working hard every day to give your child the very best early childhood education and care. These people will be with you for a long time so make sure you feel welcomed into their family. 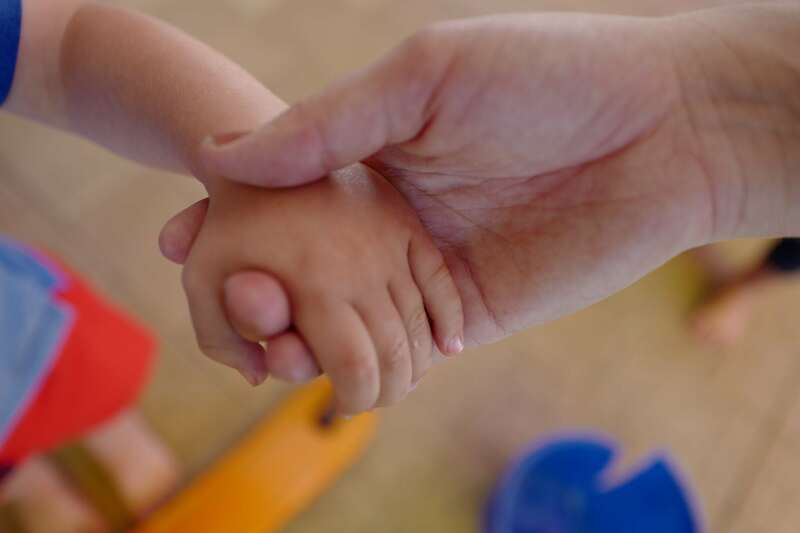 It is always difficult to trust someone with the care of your precious little ones so go visit centres and have a look around to find a place that gives you a good feeling. Obey your gut instincts and have confidence in your choice. Kids College aims to be your home away from home and is very proud of our long term relationships with our families. We are almost nine years old now and have families who have been with us for that long. I remember the days when I did all the admin work setting up our centre late at night while my two young daughters slept. People used to answer my newsletter emails at midnight and it was an incredible feeling when Kids College was finally opened and we got to meet all my late night pen pals.